I’m going to go ahead and declare February “Chocolate Month” because it’s going to be all chocolate recipes around here over the coming weeks. I’m not sorry. I got wind of these brownies from Bon Appetit before my issue even showed up on the mail. The reviews looked pretty promising and the headline “Best Ever Brownies” appeared next to the photo on the cover. I was doubtful. Any brownies that contain nuts can’t be “best ever” in my book. I don’t do nuts in my brownies. The nuts just take up valuable space that could be filled with more chocolate, so why bother? What I’m trying to say is that I wasn’t sold on baking these brownies until a few days later. We got a big snow storm mid-week – the kind where the snow falls at 2 inches per hour and the roads are a slippery disaster area. My 20 minute commute turned into a 2 hour nightmare that I thought would never end. When I finally got home (in one piece with only a slightly dinged car by some miracle), I was so tense I could only think one thing: I. Need. Chocolate. Staring back at me on the kitchen counter were those well-hyped brownies on the cover of Bon Appetit. I forgot about dinner and got mixing right away. I loved how easily these brownies came together because I was out of patience that day. Everything mixed up in one pot. The first bite of that warm brownie just melted away the stress of the day. They’re my favorite texture for brownies, a perfect balance between fudgey and cakey. They’ve very moist and very, very chocolate-y. I haven’t had Ghiradelli brownies from a box in years, but they used to be my favorite and from what I can remember, these brownies taste very similar. Are they “best ever” (without the nuts)? I’ll let you decide. Me? 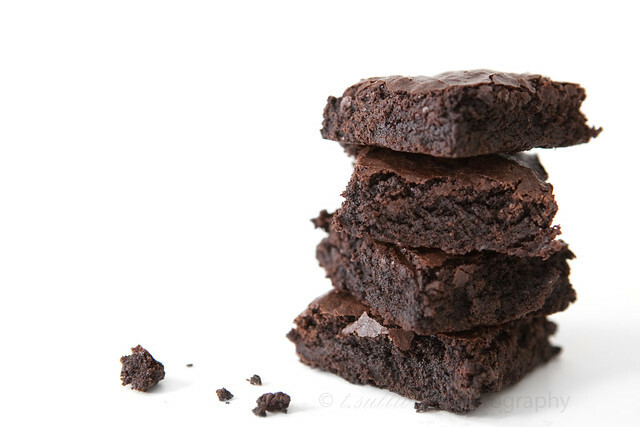 I would definitely put them in my top 3 favorite brownie recipes! While the original recipe calls for chopped walnuts, I think what these brownies really need is chocolate chips. The original recipe also calls for a 4-hour cooling time, which is preposterous. Who waits that long to eat brownies? I gave mine about 45 minutes to cool in the pan and that seemed to be enough to get them out in one piece. Preheat oven to 325°F. Line an 8×8-inch pan with foil, leaving a 2-inch overhang. Spray generously with baking spray. Melt butter in a medium saucepan over medium heat. Cook, stirring often, until butter stops foaming and has a nutty fragrance with brown bits on the bottom. Remove from heat and immediately stir in sugar, cocoa powders, water, vanilla extract and salt. Cool for 5 minutes. Add eggs 1 at a time, beating until well blended after each one. Once thick and shiny, add flour and stir vigorously for 1 minute. Pour batter into prepared pan and bake at 325°F for 25-35 minutes, or until a toothpick in the center comes out with just a few moist crumbs. Cool in pan on rack. To serve, lift brownies out of pan using foil overhang and slice into squares. Yum- can’t wait to try these. This recipe is actually the next recipe that will be featured on Culinary Covers.com too- which I’m trying to get up for today! I have that issue of Bon Appetit laying next to my bed. It’s pervading my dreams. I’m with you on the brownies…sans nuts of course! These look beautiful. I ALSO have this issue of Bon Appetit and have been drooling over the cover. I am not a fan of nuts in my baked good so I will try your version of the recipe. These look so good! I feel the same way about nuts, I don’t really like them in any dessert, but especially not brownies. This is my favorite kind of texture for brownies, but Brandon doesn’t like anything cakey or fudgey because he is a big weirdo. I may have to make some of these for my birthday and just eat them all by myself! Calories don’t count on your birthday, right? These sound scrumptious! 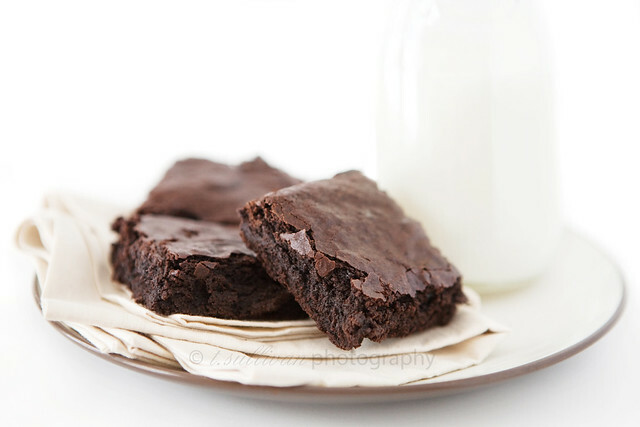 Did you see the recipe for Salted Fudge Brownies recently featured on Tasty Kitchen? They might make your list a top four. And definitely – no nuts! i know everyone has an ingredient that immediately draw them to a recipe, & “browned butter” is one of mine. however, i’ve never really tried it with something chocolaty. can’t wait! also, when it comes to brownies, i say YAY! chocolate chips, & NAY! nuts. they had me at browned butter! these look amazing, but I’ll definitely need nuts. walnuts. or pecans even. decisions! yum. I’ve been looking through a bunch of your recipes. and they’re all YUM. I’m brand-spankin new to the food bloggin-sphere and i am newly in love with yours. keep them coming!! Made these yesterday afternoon. I don’t have any brownies left this morning. They are that good. Both of my parents are hard to please with brownies/cakes (they prefer the boxed mixes. EW) But they both kept going back and sneaking a piece. I want to try these. I like brownies both ways with nuts and without. A nut topping with a pure chocolate brownie would be a good compromise for me.